Russia has developed missiles that no other country possesses, President Vladimir Putin has claimed in comments that could spark a new arms race with the US. They include a "new supersonic weapon" that can reach almost any point in the world and cannot be tracked by anti-missile systems, he said. The weapon was successfully tested in late 2017, he added. He later suggested Moscow only envisages using the missile in response to a nuclear attack, rather than being the aggressor. "The response would be immediate," he said. Putin made the claim during his annual state of the nation address to Russian MPs in Moscow. It comes after the US was said to be developing smaller nuclear weapons in the belief they would be more of a deterrent than larger ones. Putin also claimed Russia was testing underwater drones that can carry nuclear warheads. This year is the first time the speech has been delivered in March, according to the Moscow Times. It is usually given in December. Russia will hold presidential elections on March 18 and Putin is the overwhelming favourite to win another term in office. What else did Putin say? 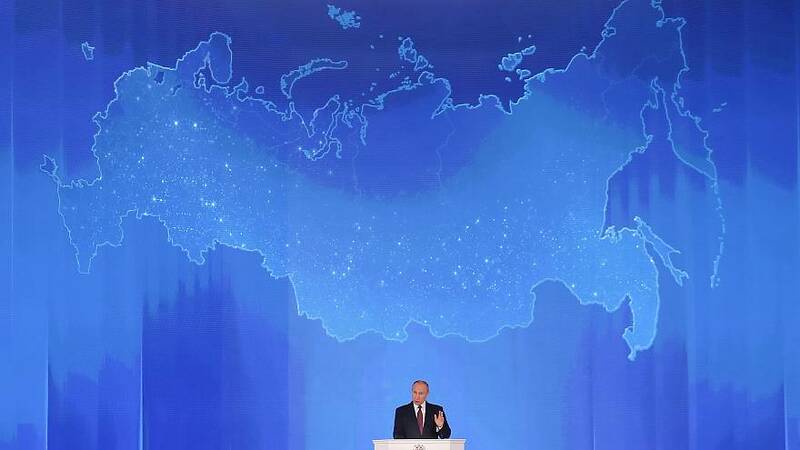 Putin also pledged to cut the Russia's "unacceptable" poverty levels in half in the next six years, during his state of the nation address to Russian lawmakers on Thursday. "(We should) at least halve the poverty rate in the next six years," said Putin. The Russian leader said 20 million Russians currently live below the poverty line compared to 42 million in 2000. Putin also called for a push in technology, saw room for lower interest rates in Russia, and said the government would need to create a new tax framework to support economic growth. "Lagging behind in technology is the main threat and our main enemy," he said.